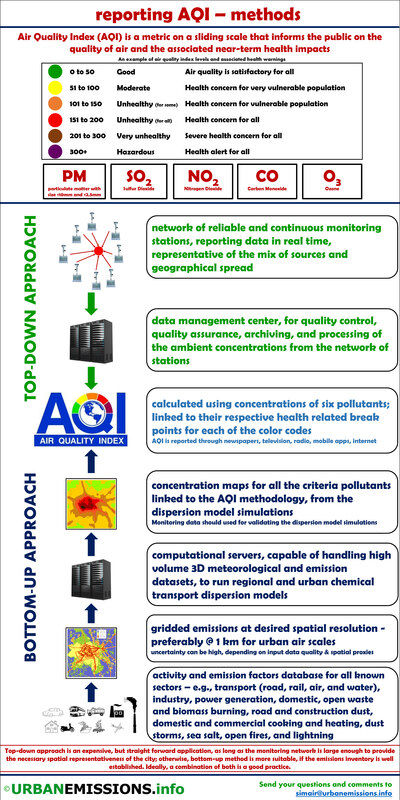 An effective air quality management program requires reliable information on ambient air pollution with substantial spatial and temporal coverage. This information is commonly collected and collated via monitoring campaigns (stationary and mobile on ground systems and part support from the satellite measurements, which is new today). This is also an ideal database to statistically forecast what will be the pollution levels in the next 3-4 days, knowing how the pollution levels behaved in the past under similar meteorological conditions. However, this database is not enough to explain the highs and lows, source contributions, and spatial patterns of pollution. In such a case, especially when lesser number of monitors are covering the urban airshed, forecasts based on multi-pollutant chemical transport modeling systems is a necessity. The infographic presents a case with the air quality index (AQI) as one of the indicators.